As the heat of summer keeps . . . well . . . heating, a qucik and easy, icy cold dessert is a must. Now, my husband and I do enjoy ice cream, but we absolutely LOVE sorbet. Healthier, too. I make sorbets from all sorts of different fresh fruits, many times depending on what is locally in season or that I can find organically grown. Or even frozen, again, buying organic whenever possible. 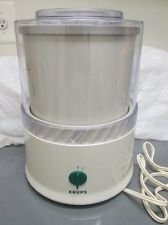 I have been making sorbets for over 20 years now in my trusty Krups ice cream maker. The recipe used is an adaptation of one found in the 1995 July/August edition of Cook’s Illustrated. You should see how worn and rather fruit smudged that page is! The sorbet I make the most has to be blueberry. Not only are blueberries my all time favorite fruit, but those tiny things are packed full of nutrients, antioxidants and are touted to have all sorts of health benefits. Plus, they taste soooo good! 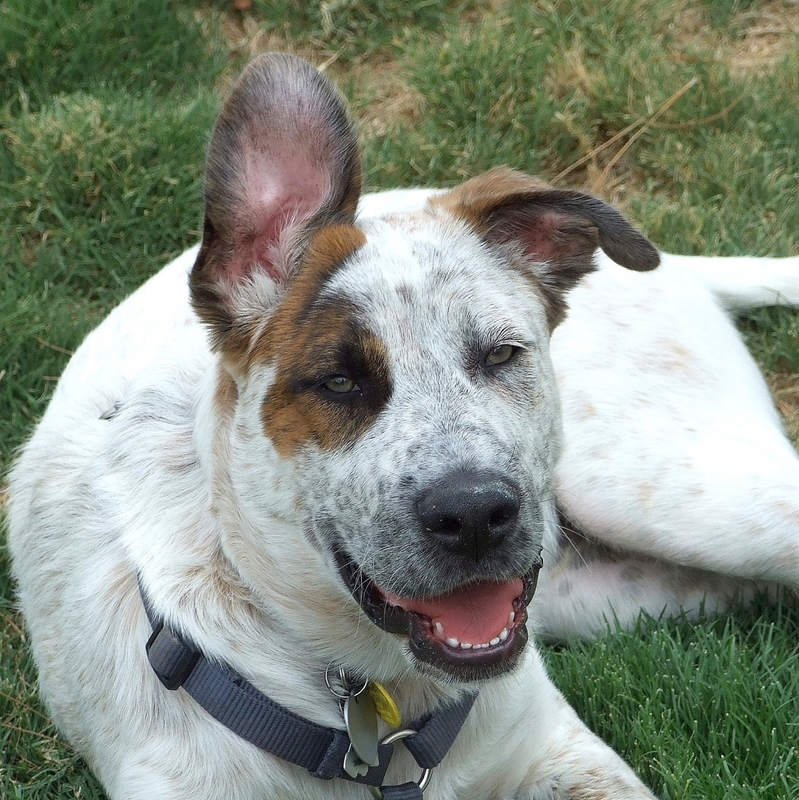 Even Seamus (our Shadow Dog), loves to eat them mushed up in his food. Seamus wondering, "Did you say "blueberries" in my food tonight? Please!" We all know that water freezes at 32 degrees F / 0 degrees C. When sugar is added to water, the freezing point is lowered; the more sugar, the lower the freezing point. 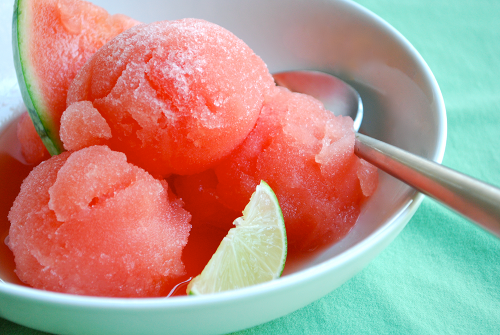 Many ice cream makers or freezers cannot harden the sorbet successfully. The water will freeze but the fruit syrup is often left slushy in the container. The vodka basically binds the water molecules to the syrup and causing smaller crystals to be formed. Smaller crystals = a creamier texture to the tongue. Using a bit of alcohol also allows you to cut down on the amount of sugar. Only a small amount of vodka is used - you cannot taste it and the alcohol evaporates out in the churning. My Krups electric ice cream maker is 22 years old and still running well. The canister has double insulated walls and is kept in the freezer until it's ready to be used. 1. Wash the blueberries. Puree them and the water in a blender or food processor until smooth You should have about 2 cups or so of puree. 2. Combine the blueberry puree, sugar, lemon juice and vodka in a large bowl. Stir until the sugar is dissolved. I found a wire whisk works very well to dissolve the sugar quickly. Hint: I use a metal bowl for the puree and set that bowl in a larger bowl that has been filled with water and crushed ice cubes. This helps speed the freezing process in the ice cream maker. 3. Check the temperature of the puree. It should be no more than 40 degrees. If it needs to cool, then refrigerate. My puree has never needed to be refrigerated since the puree bowl is put in the larger bowl of iced water. 5. Scoop frozen sorbet into a container and put into the freezer for several hours to firm up. Note: I usually fresh squeeze the lemon juice but have used ReaLemon in an emergency when I forget to buy a lemon for the 1 TBSP of juice. I especially love the combination of peach and mango - almost as much as the blueberry. The lemon and lime sorbets are perfect after a seafood meal. The only fruit I tried and was disappointed with was fresh cherries. Weird texture sorbet with all the skin and an unappetizing somewhat gray color ): Probably should have strained the puree but would have still been put off by the color. 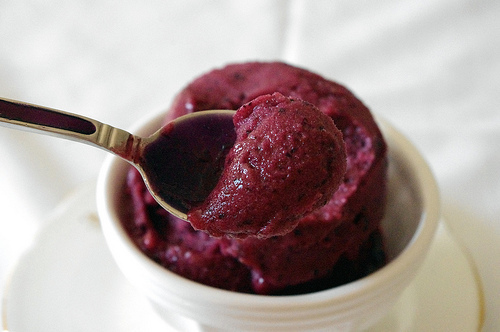 So there you have it, my all time favorite blueberry sorbet recipe. I find making these sorbets to be fast, easy, healthy - and, above all, very, VERY tasty. These recipes are the creamiest sorbets I have ever made / eaten. I hope you try a recipe or two. Enjoy! You will make my day if you leave a comment. Thanks! Looks so good and a cool dessert for the summer, thanks for sharing this recipe. My pleasure, Diane! I only wish I had thought of sharing it earlier, now that summer is close to being over. But there will be plenty more hot days, I'm sure. I feel a brain freeze coming on!! What a great post and thank you so much for sharing this wonderful recipe! My grands will love it. I am always looking for goodies to make for them as they live the full vegan/organic lifestyle (wish Grandma would!). Will share this wonderful and refreshing post. Hey, I'm glad, Kathy, that the recipe will come in handy to make for your grands. Let me know how they and you like it. Wish I could share some with you, Sharon! Making the sorbet is really very easy - perfect for those hot summer days there in Georgia! I wish I had an ice cream maker now that I have read this blog. This has to be soo good! Since I have a blueberry patch, the sorbet would be perfect! Thanks for sharing. I may have to come back to this. Oh, I do miss the blueberry patch we had in Virginia, Jo - lucky you! It would be cool to make the sorbet with your own fresh picked blueberries. Let me know if you do that! The sorbet really is, Nancy! Thanks for stopping by. First, I need to get an ice-cream maker! 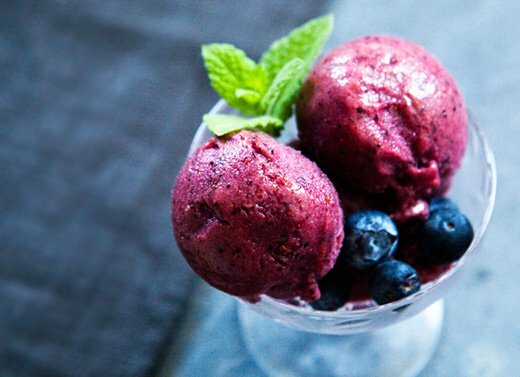 Love blueberry, love sorbet. This recipe must be divine! Thanks for sharing. The recipe IS divine, Nat - and so easy! I hope you do get an ice cream maker and try the recipe! Let me know of you do. Having a heatwave right now here this weekend - 106 today, so sorbet would be most welcome. We just might need to add an ice cream maker to our new kitchen! Had a feeling a teacher would appreciate the science of adding vodka to the sorbet (: An ice cream make definitely would be a perfect addition to your new kitchen, Lisa. Let me know if you try the recipe. Catherine, those look delicious. Seamus looks so handsome. Thank you for sharing! Oh man, you had me at blueberry but you put me over the edge with watermelon! Ah, if only I had an ice cream maker! Very tasty blog, Catherine!